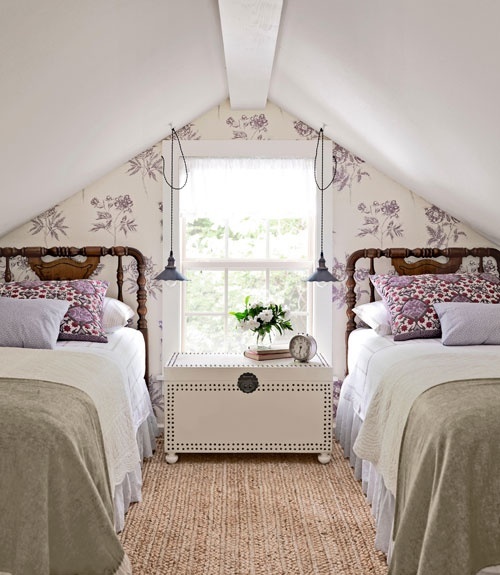 LOVE this twin bedroom from Country Living. Such a beautiful impact in a very small, slanty space...and the pieces in the room are just so darn pretty. A touch of wallpaper and some intricate pillow shams transform otherwise simple elements into something very special. I could perhaps do without the dangling sconces, but otherwise, I would adore having this as a guest bedroom in my own home. Off to celebrate another wedding this weekend! Have a fantastic couple of days off...see you Monday! Although tall people may hit their heads when waking up in one of those beds, I do love the look of the room. Especially the trunk. I love every single element of this room- rug, lighting, beds, trunk wallpaper. Just perfection.